How do you produce visual content and use it to catch your audience’s attention? Earlier this year, I conducted a webinar on the topic. Now, I share with you the 16 tips your content marketing team needs to try. Now, this may seem like an obvious tip, but it needs to be reinforced. It’s crucial that your team is communicating visually across platforms. Does your team have a policy to always include a visual on Facebook or Twitter? Posts with images get 2.3 times more engagement on Facebook. Buffer found that its tweets with images were retweeted 2.5 times more than non-image tweets. The NFL’s Baltimore Ravens have a mandated policy to include an image in a Facebook post, according to Digital Media Manager Erin Herbert. When the team applied this visual-first approach across all its digital channels, engagement increased across the board. 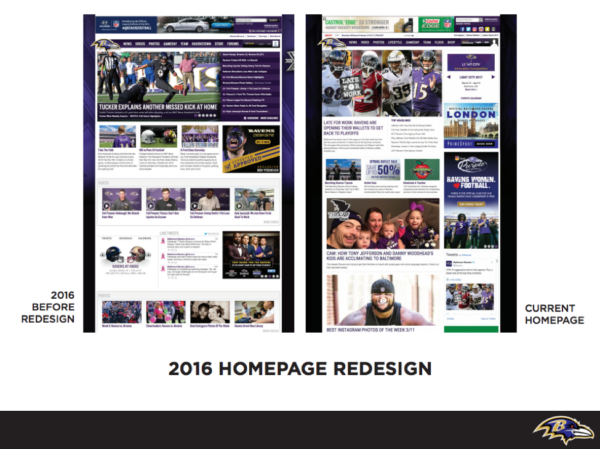 When the team redesigned the Ravens website to put photos and videos in the spotlight, it saw a 23% increase in time spent on the home page, and a 2.4% increase in users clicking to watch a video or view a photo gallery. Do an audit of your website, social media channels, emails, apps, and more, and make sure you’re using photos and videos to catch and retain your fans’ attention. Now that you’re focused on using visual content, how can you make sure that content stands out? Start with an irresistible idea. The Visit Norway team challenged several agencies to pitch a creative idea for a summer campaign. One pitch caught its attention from the start: #SheepWithAView, the chance to see Norway through the eyes of its roaming sheep. Throughout the production and rollout of the campaign, the creative team stayed true to the simple, quirky concept. As a viewer, you could meet a sheep on Instagram, click to a landing page to watch a video about the sheep’s life, and fall down a rabbit hole of similar content. The campaign went viral, racking up 87 million impressions and a million engagements on social media between June 25 and August 13, according to Beate Gran, digital media manager for Visit Norway New York office. The strongest brands have a consistent visual identity. When you build your brand guidelines, include a photography section that outlines your photography style, key photo characteristics, and guidelines on image use on social media and your website. Include examples so everyone is on the same page. 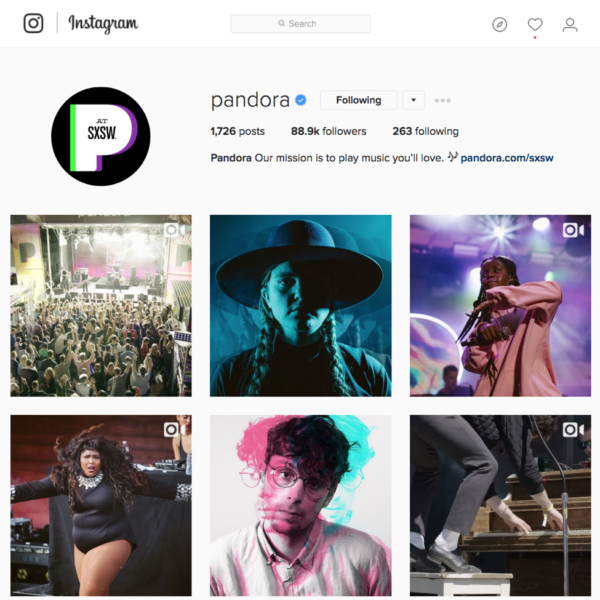 Pandora recently hired its first in-house photographer and digital asset manager, Michael Baca. While Michael shoots most of the brand’s custom photography, he also sources stock photos and hires freelance photographers. No matter the image source, his goal is to create a consistent look and feel across platforms. Make sure your photographers, videographers, designers, and marketers are all on the same page about your brand’s visual guidelines and standards so your audience has a coherent, familiar experience with your content. Customers don’t connect with products or services, they connect with a brand’s values. Red Bull sets a fantastic example of how to connect with a value through visual storytelling. Rather than making videos about energy drinks, Red Bull makes videos about energy. They know what their customers care about, and they produce content with those values at the core. What do your customers care about? What makes them tick? Creating a video that tells that story will get more attention than a video about your product. Do you know how to think more like a photo editor than a marketer? The right photo will engage your audience better than just any photo. Hiring a professional photographer can help you tell a more accurate and compelling story. The design team at Applegate Natural & Organic Meats draws a direct line from sharing professional photography on social media to sales. Lean into your craving for cheese today – it’s National Grilled Cheese Day! Get the recipe for this scrumptious grilled swiss, bacon and mushroom sandwich in our profile. Plan ahead. Make sourcing high-quality photography a priority. Otherwise, you might find yourself picking a boring stock photo the day you need to publish your content. HANDPICKED RELATED CONTENT: Is Your Social Content Picture-Perfect or Merely Taking Stock? There’s no denying it – video content is capturing everyone’s attention. Your team has no excuse not to focus on video. Wherever you are, go with it. You can start shooting short videos for social media with your iPhone or step up your video production by setting up an in-house video studio. The Graphics Interchange Format was introduced in the 1980s, and now – lucky for us – we are experiencing a GIF renaissance. 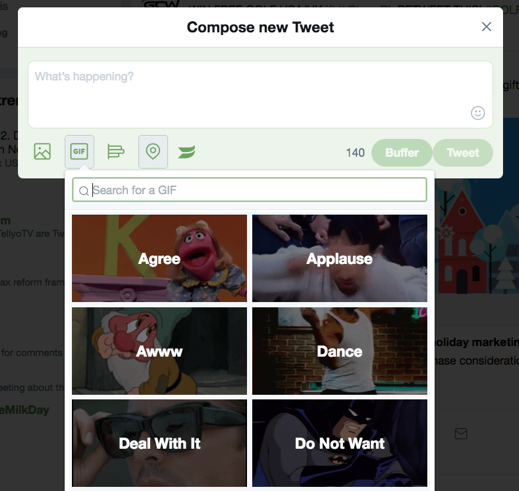 You can also use Giphy Capture or Adobe Photoshop to create your own GIFs. You can repurpose video clips, share teasers for upcoming content, demonstrate a step-by-step process, and more. Next time you’re shooting a video, think about which snippets might make good GIFs to tease your video on social media, in emails, or on your website. Encourage viewers to join in – think FOMO (fear of missing out) – If you can catch your fans’ attention while an event is unfolding, you can motivate them to join in before it’s too late. This is especially true for audiences of universities, destinations, sports teams, and retail brands. Give your audiences something they couldn’t otherwise experience – Whether it’s an exclusive event or a spectacle across the globe, give your viewer a front-row seat to something extraordinary. A perfect example of this is National Geographic’s #SafariLive. People who might never experience a safari in person have the chance to watch live and ask questions in real time. It’s the next best thing to being there. Make sure everyone on camera and behind the camera is on the same page. Experiment with using 360-degree video to establish a sense of place. Visit Las Vegas uses 360-degree video to drop you into trademark Vegas scenes, from the hottest parties to a zip line over the strip. Some 360-degree videos give a better view than someone could ever get on their own. Check out this video that lets you fly over the Grand Canyon on the outside of a helicopter. Not every story should be told in 360 degrees. Don’t sacrifice the story for visual effects. Think about viewing a 3D movie that you would have preferred to watch in standard two dimension – the wrong format can feel forced and take away from the story. What unique views and experiences can you offer your audience with 360-degree video? User-generated content (specifically, user-generated visuals) can infuse your brand’s storytelling with authenticity. Incorporating content from your followers into your social media, website, and other communications can help you present a more balanced, well-rounded view of your brand. UGC is especially popular in the travel industry. Now that travelers turn to Instagram to check out a city, hotel, attraction, or restaurant, travel brands are using hashtags to curate fresh content from different perspectives. Then, the users who generated the content feature it on their own social channels or embed it on their websites. 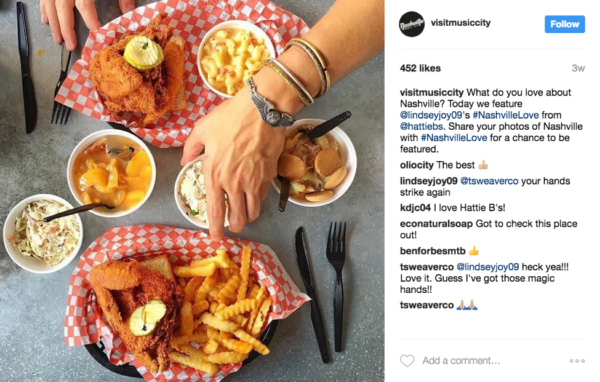 In the example above, the Nashville Convention & Visitors Corp shares UGC on its Instagram, which gives the Instagram an authentic feel. Brands also can create experiences that lead people to create and share UGC. 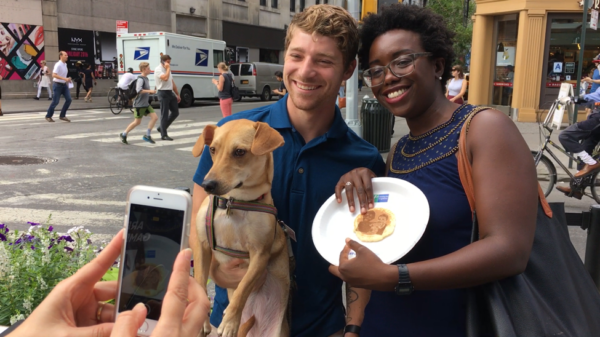 Holiday Inn Express parked a pancake-selfie truck in New York City. Visitors could have their selfie printed on a pancake. Seeing your face on a pancake is an experience that begs to be shared. Remember to pay close attention to usage rights and make sure you have permission to use UGC before you feature it in any communications. Just because you have permission to use a fan’s photo on your Instagram doesn’t mean you can use it on a billboard. Graphics and infographics are a great way to demonstrate a concept visually even if the concept is not inherently visual. 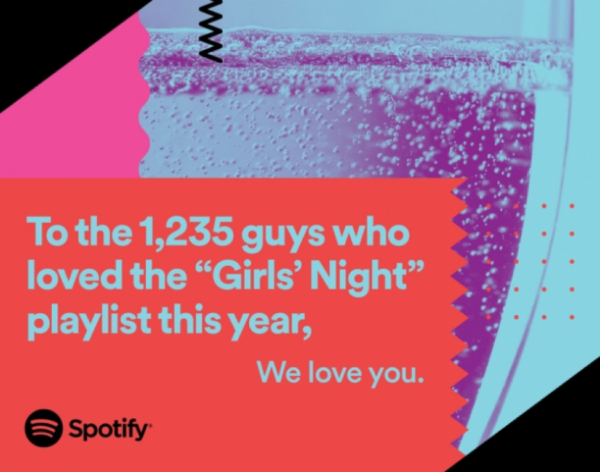 Spotify, for example, combined brightly colored graphics and clever copy to illustrate user data. Free tools like Canva and PicMonkey allow you to create quick graphics for social media and more. Tools like Venngage and Ceros allow you to make longer, more interactive infographics and landing pages. Influencers can bring a fresh perspective to your brand and help you reach a new audience. But how do you ensure a return when you’re working with influencers? 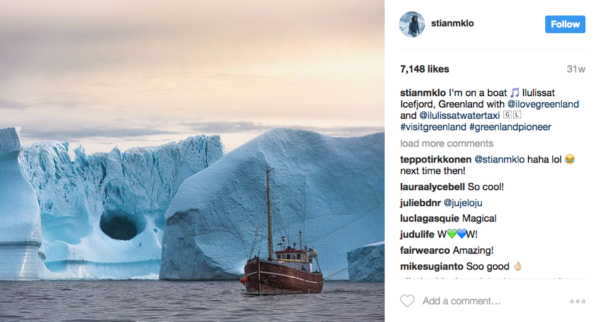 Visit Greenland asks influencers not only to share content with their own social media, but also to submit a number of visual assets to Visit Greenland’s database. That way, Visit Greenland can repurpose the influencers’ content and help it reach a broader audience. Choose on-brand influencers, not just those with large followings. Give them unique experiences with your brand and work with them to share their content through a wide variety of channels. The stories unfolding every day about your brand are often more interesting than the stories you brainstorm in a marketing meeting. Listen for those stories. Keep open the lines of communication with your employees and your customers, and let them know you’re looking for story ideas. Remind them that no story is too small or insignificant. Sometimes the simplest stories are the best ones. “Hudson’s Big Day” started as a Facebook post. A mom shared a photo of her son who just had an incredible experience. Behind a fence, Hudson watched planes land and take off when a pilot stopped his plane and waved to him from the tarmac. Southwest noticed the post and picked up the story. They contacted the pilot, set up a tour of the plane for the little boy and his family, and recorded the experience. They shared the video with their own internal team and on social media. According to Brooks Thomas, social business advisor for Southwest Airlines, they even use the video to train new employees to show how they want all employees to go the extra mile. Your brand has incredible stories to tell – make sure you’re listening for them. Followers love seeing brands interact with each other on social media. You often see this during major events like the Super Bowl or the Oscars. The #CuteAnimalTweetOff – perhaps the best battle ever to happen on the internet – is a fantastic example of how a playful back-and-forth with another brand can delight your fans. It all started when a fan saw a cute photo in the National Zoo’s Twitter feed, and challenged her local aquarium (Virginia Aquarium) to share an even cuter photo. Zoos and aquariums across the country started chiming in, sharing their own adorable photos. The #CuteAnimalTweetOff went viral and was picked up by several major news outlets. Make sure you have a good dance partner. If you want to have some fun with another brand on social media, sometimes it’s best to make sure they’re game, then let the conversation evolve organically. Your fans want photos now. And at a time when everyone carries a cell phone, you have to get your photos out faster than everyone else. Your brand’s photo has the best chance of dominating a trending conversation if it’s the best photo and it’s shared quickly. You need fast access to your professional photographer’s photos. Don’t settle for the shot your social media coordinator snapped on a phone. The Colorado Rockies use a real-time image delivery workflow with an FTP system. The team photographer uploads photos from the field to the team’s visual media library, where the social media manager can access them. 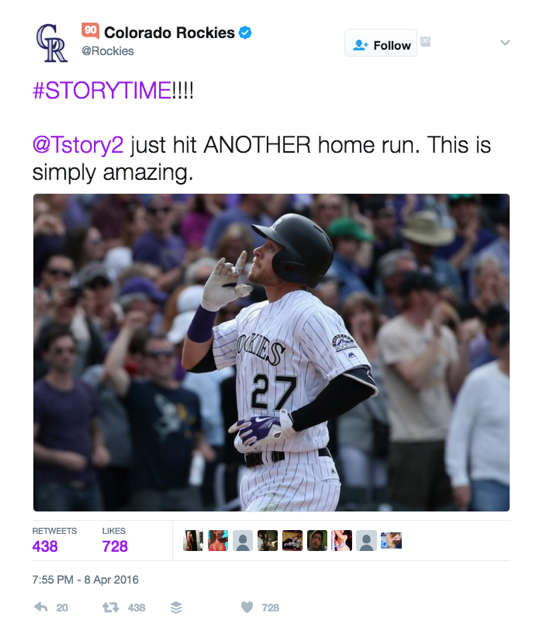 The best photos of a home run, for example, are on social media within seconds after the batter crosses home plate, ready to be retweeted by thousands of fans. If your photographers use FTP to share photos, make sure they have a lightning-fast Wi-Fi connection. Some photographers carry portable Wi-Fi hotspots to ensure that they have access. Audiences love behind-the-scenes content, and Instagram and Snapchat stories are perfect for giving fans an insider’s look. Think about the perspective only you can give your fans. What can your team access that a journalist can’t? Test that content in your Instagram and Snapchat stories. You may find you should share that content across all your social media channels. 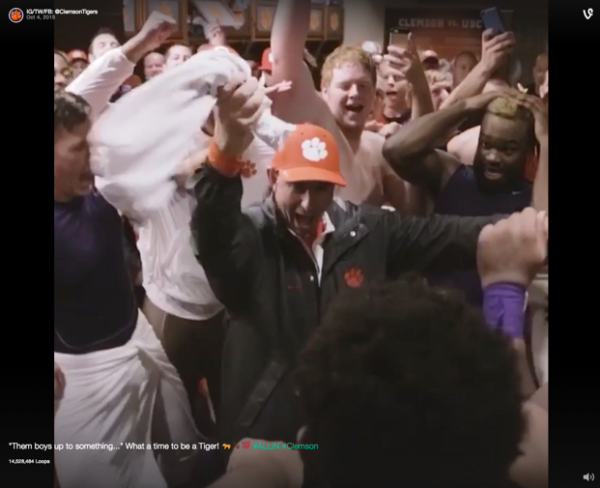 The Clemson Tigers are setting a standard for the best social media in college sports because they are masters of behind-the-scenes content. Every piece of content shared gives the viewer a sense of what it’s like to be a Clemson Tiger. Rather than sharing generic shots of the team celebrating a win on the sidelines, viewers see the team dancing in the locker room. Sometimes, you must convince your own team to let you share a behind-the-scenes look at your brand. Take the time to earn their trust – it will pay off. You don’t have to try all 16 visual storytelling tips this month. Start with one. 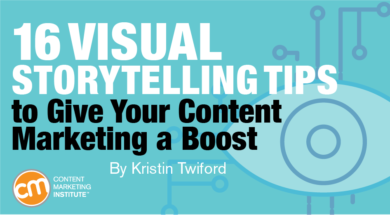 Adding a little more visual storytelling to your content will give your marketing a boost. Experiment and tackle new ideas as you go. Improve your storytelling – visual and text – and much more in your content marketing programs. Subscribe to the free daily CMI newsletter (or weekly digest) for more tips, trends, and topics to help your success. Kristin Twiford is the Content Marketing Manager for Libris by PhotoShelter, where she covers visual storytelling trends and best practices. She uses her background in television production, daily news and communications to produce written and video content for social media, marketing and sales. Follow her on Twitter or connect on LinkedIn.